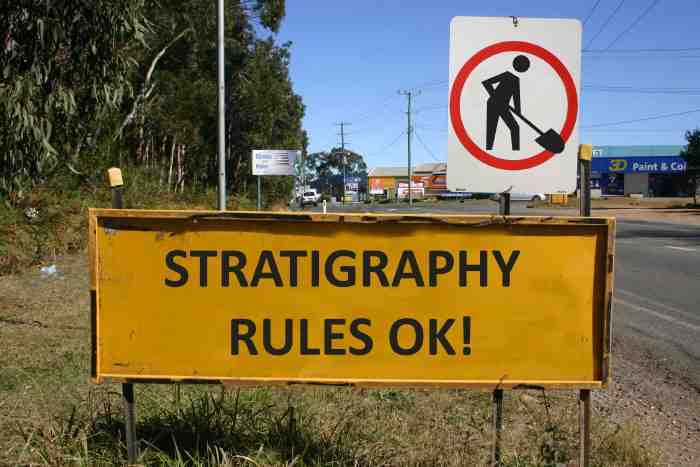 EH&A - Projects - Stratigraphy Rules OK! One of the first things that any volunteer learns on an excavation is that "Stratigraphy Rules OK!" Everything is recorded layer by layer, with artifacts separated in accordance with individual layers or context. Richard Cullen, retired school teacher, was the person who coined this phrase and Gerry Walsh is the person responsible for the revised road signs. Both were members of the volunteer team that helped complete the excavations of the Glasshouse at Port Macquarie in 2006. If you would like to work on an excavation, why not sign up as a volunteer? Want to find out more about excavation techniques? Here are some useful handbooks. Jane McIntosh. The Practical Archaeologist. Facts on File Inc. New York. ISBN 0 8160 1814 6. Edward Higginbotham. "Excavation techniques in historical archaeology", Australian Journal of Historical Archaeology, 1985 vol. 3, 8-14. When I wrote this paper recommending area excavation, the technique was hardly used in Australia – how things change! Thanks to John van Tilburg for the references to the handbooks.